This newest type Depstech wifi endoscope has surpassed the traditional endoscope s using limitation for iPhone user. It can work perfectly with Android 2.3+ and IOS 6.0+ smartphone. Will be a best inspection tool for iPhone user. At Depstech, every product enjoys a 1 Year Limited Free Warranty. The Newest Type Endoscope : Unlike other endoscope camera on the marketplace, this wireless wifi endoscope camera not only work with Android smartphone(Above Android 2.3), but also iPhone IOS system(Above IOS 6.0). This is perfect for iPhone user who want do inspection work. Without using extra adapter or cable, it can be easily connected with your smartphone via WIFI. The only thing you need to do is to download and install the compatible APP "DEPSTECH"on your device. Unique Blue LED technology : 6 adjustable blue LED light on camera tip, it greatly helps to improve image brightness and clarity even in dark or low-light condition. Moreover, the art of 1200P camera offers you a wonderful experience of recording a clear close range HD video in AVI format and snapshot image in JPG format with four adjustable resolutions 320x240, 640x480, 1280 x 720,1600x1200. 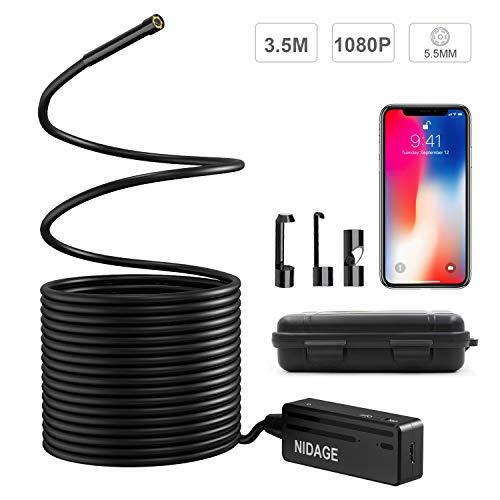 Featuring 11.5FT cable, waterproof and 8.5mm diameter camera : this endoscope can suitable for various types of environment, for example, low-light or dark area, damp or wet area etc. Furthermore, armed with bendable semi-rigid cable which can bend and hold it's shape to access a wide variety of confined place. Premium Camera Chip :Adopting the second generation chip at 30fps, which is best for acquiring the smoothest video and image, and this is a great advantage over the other products at 10fps on the marketplace. Design Patent :For this WiFi version endoscope, we have applied the certificate of Design Patent. Machinery inspections (gearboxes, molding machines, cylinder bores, etc.). Support 1 - 2 devices to be connected simultaneously to view the live inspection images or videos. Mini 5.5mm Borescope The wireless endoscope camera probe is only 5.5mm (0.21 inch) in diameter, armed with bendable semi-rigid cable, which can easily access to dark & confined places for nondestructive testing like pipe, mechanical equipment, auto maintenance, carbon deposition, cylinder, engine and other devices. Distinct 1080P Wifi Camera The resolution of industrial video scope can reach 1920*1080 in maximum. 6500K sunlight highlighting LED technology ensures clear image and restore details under dark conditions. Premium Camera Chip 30fps velocity ensures the smoothest video and image in vibration, which offers better experience than 10fps endoscope camera on marketplace. WiFi Connection & Wide Compatibility The wireless endoscope is iPhone IOS & Android compatible. Please download HD Wifi APP from Google Play or Apple store for easy set up. 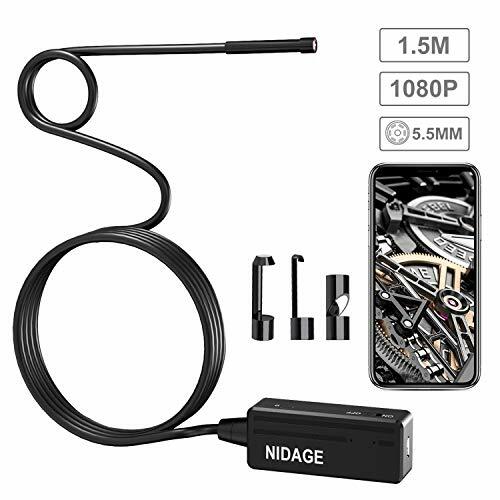 Durable Automotive Tools NIDAGE is the professional manufacturer of inspection camera with 12 month warranty. Each borescope is severe environment test & drop resistance test (1m drop test) approved to insure reliability and durability. A must have IP67 waterproof usb inspection camera. 1.NOT support iPhone, iPad, Windows Phone! 2.Please make sure your android phone supports OTG and UVC function (This is VERY Important!). Even if you're new to use endoscope, you'll be able to get the hang of operation quickly. Once installed the app, plug it into USB port on your computer or USB-C/micro USB port on your phone, then you're ready to go. Please contact us via Amazon message if there is any question about the item. 5.5mm Diameter Tiny Camera The diameter of this endoscope camera head is only 5.5mm(0.216 inch), perfect to get into very small holes for inspection. Semi-ridged Cable Armed with a bendable cable that can bend and hold it's shape to access a wide variety of confined place, such as curved holes or pipes. What You Get 1x Snake Camera, 1x Micro-USB Cable , 3x Accessories(Mirror, Hook, Magnet), 1x User Manual, our worry-free 12-months warranty and friendly customer service. 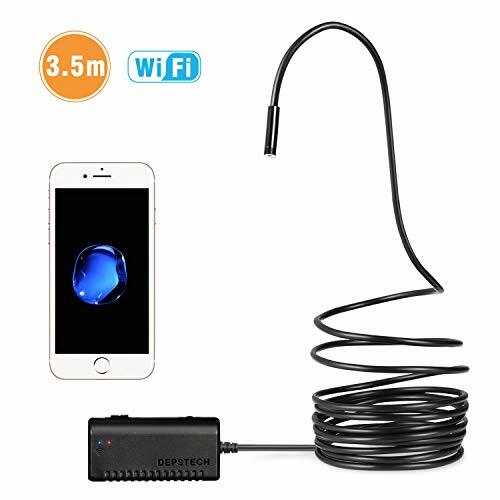  REACH THE NARROWEST SPACE WITH UPGRADED WIRELESS ENDOSCOPE CAMERA - Newest WiFi Endoscope which equipped with 5.5mm smaller camera probe, extending your eyes or hands access to the place hard to reach. 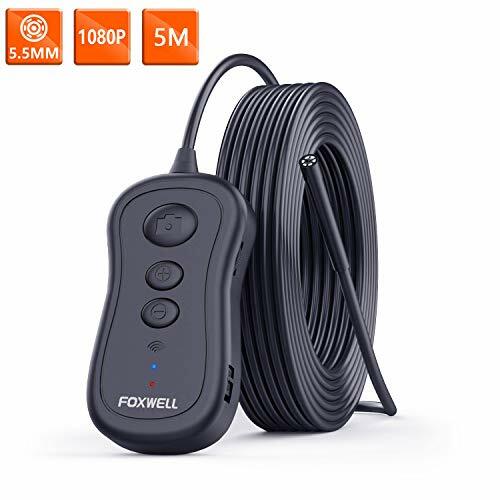 If you are looking for a reliable device to inspect pipelines, wall crevices, sewers, cable chute problems, FOXWELL borescope camera is precisely what you need. LONGER WORKING TIME, NEVER WORRY ABOUT BATTERY WILL DRAIN OUT QUICKLY - A great improvement compare with other similar product, our wifi endoscope inspection camera can meet all your needs even over longer usage. Built-in 2200mAh rechargeable battery, adopts high capacity and high performance battery core to bring you a long lasting using time up to 4-5h after fully charged. OPTIONAL KEY OF ZOOM IN AND ZOOM OUT - Just need to press the + or - button on wifi box to adjust the view freely. Very convenient for you to zoom the picture on line to inspect some areas such as cable in pipes, machine equipment, engine, drain, circuit board more clearly and accurately. REAL 1080P RESOLUTION SNAKE INSPECTION CAMERA - The resolution ratio of endoscope can maximally reach 1920*1080, which allows you to enjoy a great inspection experience with a clear, close-range recording of captured snapshots for documentation. And the 6 adjustable blue LED lights on the camera tip to help with the improvement of the clarity and brightness of images in dark and low-light conditions. 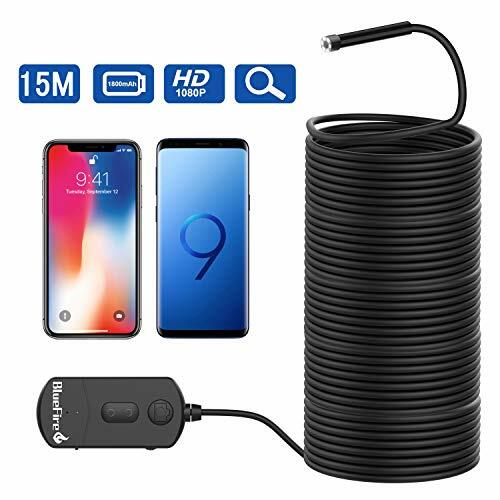 WIFI BORESCOPE INSPECTION CAMERA WITH GREAT COMPATIBILITY - Built-in wifi signal, not only can work with Android smartphone or tablet(Above Android 2.3), but also iPhone IOS devices(Above IOS 6.0). Without using extra adapter or cable, it can be easily connected with your smartphone or tablet via wifi. 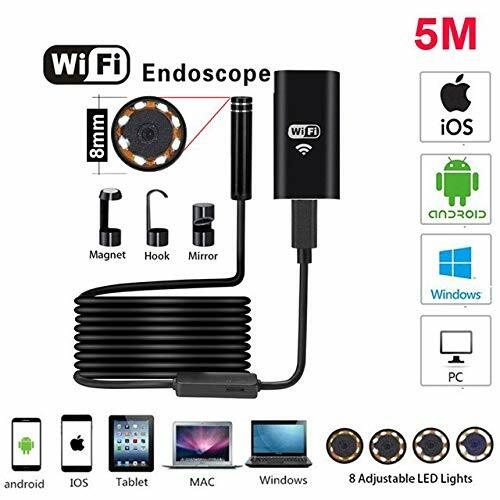 The Upgraded WiFi Endoscope: Unlike other endoscope camera on the marketplace, this wireless wifi endoscope camera not only work with Android smartphone(Above Android 2.3), but also iPhone IOS system(Above IOS 6.0). This is perfect for iPhone user who want do inspection work. 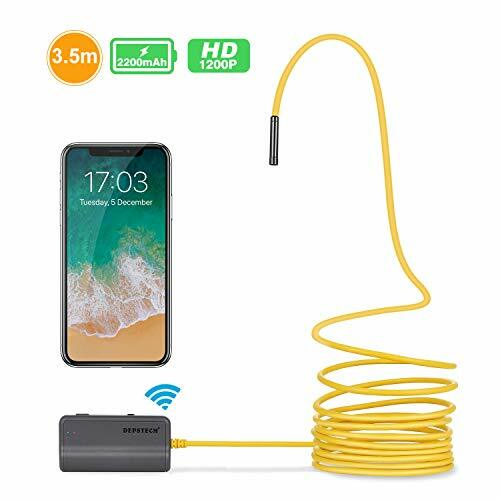 Wireless & Easy to Set Up - Without using extra adapter or cable, this Wi-Fi borescope can be easily connected with smart phone via WIFI. The only thing you need to do is to download and install the compatible APP DEPSTECHon your device. High Resolution Camera: Featuring with 2 Megapixels HD camera, this endoscope offers you a wonderful experience of recording a clear close range HD video in AVI format and snapshot image in JPG format with four adjustable resolutions 320x240, 640x480, 1280 x 720, 1600 x 1200. 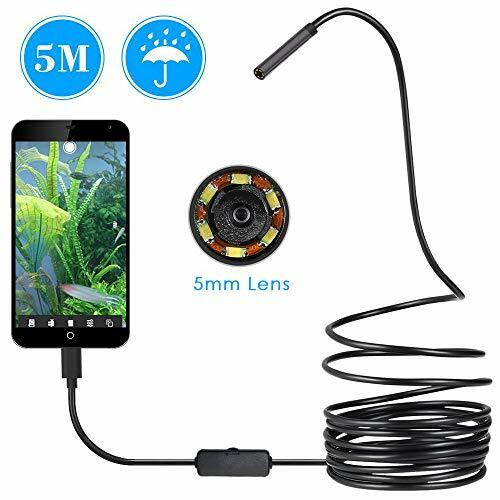 Featuring 11.5FT cable, waterproof and 8.5mm diameter camera, 6 adjustable LED light on the camera, it is suitable for various environment, like low-light or dark area, damp or wet area etc. The semi-rigid cable can bend and hold it's shape to access a wide variety of confined place, such as curved holes or pipes. Furthermore, it has upgraded the lithium battery capacity up to 2200mAh which support 4-5h working time without LED light on. A great improvement compare with other similar product. PERFECT HOUSEHOLD TOOL : ScopeAround Micro Otoscope Camera, check your ears anytime on your own with Android smartphone or computer , Diagnose Outer and middle ear pathologies in time. 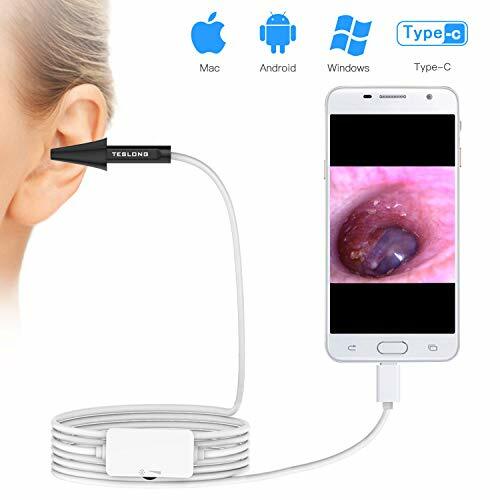 EASY TO USE AND MULTI COMPATIBILITY : The easiest way to use ear camera with Android, Windows & Mac, just connect in then open the app and see the Video Stream in the Preview Area.You can also save images and videos of the mirror and send them to your doctor for guidance. INTIMATE AND SAFETY DESIGN : The speculum protects the ear canal from the ear endoscope entering too deeply, and it can also be effectively insulated from overheating. Also, there are 2 Different Sizes of ear-pick for you to choose. WATERPROOF AND EASY CLEAN : The ear scope is Waterproof, So you can wipe it with alcohol or water to clean. But please don't soak in water too long. 100% CUSTOMER SATISFACTION : We provide 12 months replacement guaranty for ScopeAround ear camera scope, unconditionally refund or resend with any quality problems, 24 hours quick reply.What are you waiting for? Iyzer wireless endoscope is designed as the perfect tool for your inspection needs. Without any extra cables, you can start your journey of discovery by simply connecting your devices to the endoscope via WiFi. This semi-rigid wireless endoscope always provides you the clear, bright and smooth images at 30fps with its premium 2MP HD CMOS inspection camera backed by a leading camera chip and 6 adjustable LED lights. The innovative semi-rigid cable and IP67 waterproof designs ensure the performance of this wireless endoscope in the wet and confined places, even under water. 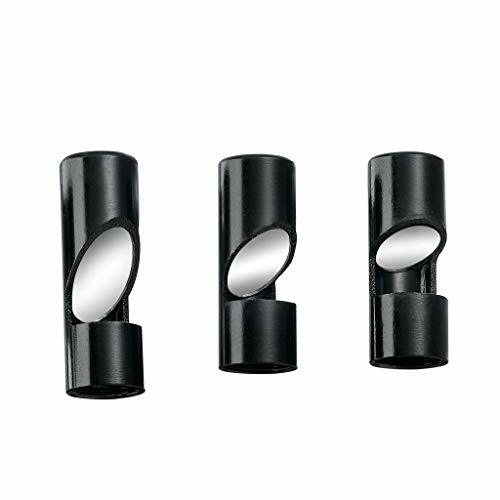 To serve your different purposes, we provide three different switchable caps (hook, side-mirror & magnet) in the package for you.  Clearer & Brighter Image : Our WiFi borescope is equipped with a premium 2MP HD CMOS inspection camera, captures and presents you the clear, sharp and vivid pictures! To ensure the brightness and clarity of the image in darkness and low-light environments, we add 6 adjustable powerful LED lights at the tip of the camera. With the powerful LED lights, you are able to have a bright and clear view in different lighting situations.  Updated Camera Chip : This wireless endoscope adopts the latest generation camera chip to process the images and videos with 30 fps, the leading fps on the endoscope market, for you to acquire the smoothest videos and images without any lags and damages. Also, you can adjust three different resolutions (320x240, 640x480, 1280 x 720) to record AVI format videos in HD quality and snapshot JPG format images.  Semi-rigid Cable & Switchable Accessories : The bendable semi-rigid cable allows you to bend and hold its shape to let the endoscope enter and inspect those confined places. As a multipurpose tool, this semi-rigid wireless endoscope has three different switchable accessories to mount at the end of the camera to serve your purposes: hook, magnet and mirror.  The Latest WiFi-Box Design : Different with other endoscopes on the market, this wireless endoscope works by just connecting your devices via wifi without any extra adapter and cable. It's the perfect tool for inspection works. This wireless endoscope camera worsk with both Android and iOS devices. You just need to scan the QR codes on the manual to download and install the WIFI VIEW app on your device, then you can start to inspect with this endoscope by log on to the WiFi. YINAMA Industrial video borescope allows engineers to check for pitting, cracking, corrosion, erosion, weld and other defects, thus minimizing downtime and optimizing planned maintenance. 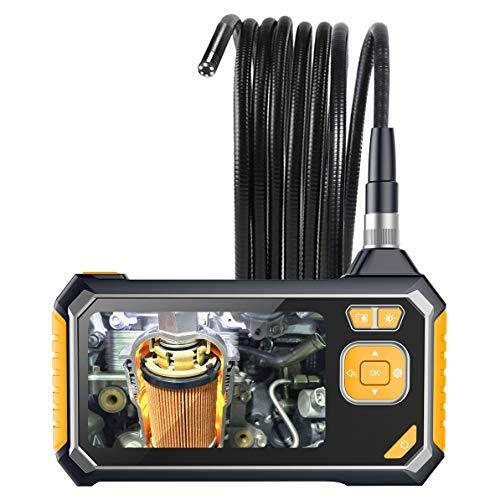 Portable video borescope can inspect condenser tubes, heat exchangers and tubes, glass line vessels, pipelines, steam and gas turbines, pumps, gearboxes, compressors, boilers, headers and valves. The Longest Focal Distance from 1.6 Inch to 198 Inch New development in camera technology enlarging the focal distance from 1.6 inch to 198 inch, now the YINAMA video inspection camera is capable of measuring flaws in a larger inspection area and from further distances than other industrial borescope in the market, making inspections easier. HD 1080P Camera Sensor & Faster Chip Super Hi-Vision 1080P HD camera allows you to capture image or record video. This industrial endoscope provides an exceptional view of your inspection area by combining a high-resolution COMS, 6 adjustable LED light and image processing software. 4.3 Inch QVGA Color Screen To further enhance your visual inspection and the possibility of detecting defects, the digital endoscope utilises a built-in 4.3inch screen which allows you to perform live analysis on your application area. It can also record JPEG images and MPEG-4 videos store on the TF card(Included), for further offsite analysis / reporting. Built-in 2600mAh Lithium-ion Battery Built-in rechargeable lithium-ion battery (2600mAh) provides up to 6 hours continuosly working time. 12-Month Warranty Industrial Endoscope with 100% Satisfication Guarantee and 12-Month Warranty. Package Contents: Industrial Endoscope, 3M / 9.8FT Snake Probe ,Micro-USB Cable, 8G TF Card, Accessories(Mirror, Hook, Magnet), User Manual. ROTEK household endoscope is ideal for automotive, HVAC,pipe, plumbing and house construction repair and maintenance. With a 4.3inch LCD screen and semi-rigid waterproof probe camera, users can view the image immediately when it is powered on. Do not require phone to download any driver software, no more worrying about smudging your smartphone. 1. 4.3-inch full color LCD screen for real-time viewing of test videos. 2. Resolution up to 1080P for image capture, video recording. 4. TF card can be installed to achieve file storage unction. supports up to 64GB Microtf card, Only supports TF cards with class 10 or higher FAT32 format(not equipped with this unit). 5. 8.0 mm diameter high-sensitivity waterproof camera with clear picture quality for different working environments. 6. Special technology with a focal length of 4 cm 500cm. 7. Screen separation control port, making it easy for customers to apply to different locations. 8. Auxiliary light source, 6 adjustable LED lights and a flashlight for easy use in dark environments. 4. Accessories -hooks, magnets, side mirrors,protective cap. 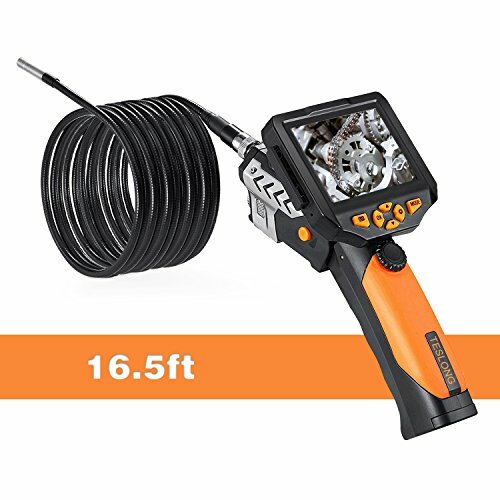 The borescope featuring 5M/16.4ft cable and 8mm diameter IP67 waterproof snake camera, enable to view hard-to-reach inspection areas such as underwater pipes, car engines, gaps and holes. The built-in lithium ion battery (2600mAh capacity) can provide inspection borescope 3.5 hours of continuous working time. The latest digital endoscope has 6 adjustable LED lights and three brightness modes, it greatly helps to improve image brightness and clarity even in dark or low-light condition. Semi-rigid Cable Design:Flexible semi-rigid cable of industrial endoscope more flexibility into all kinds of narrow places, such as curved holes or pipes. - Before purchasing, please make sure the operation system of your computer(Windows XP/7/8/10,Macbook OS) or Android Phone(Android 4.4+ system) supports OTG and UVC function. - For Android users,two software can be downloaded from Google Play Store: Depstech camera(Developed by Depstech, the image is more clearly);CameraFi(Third party general software, the compatibility is more stronger). - For MacBook OS, please use "Photo Booth" "QuickTime Player" "VLC(VideoLan Client)". -Not support Android 7.0+,iPhone IOS systems, Windows Phone, Blackberry, Motorola, LG, Galaxy S8, Google Pixel Smartphone. Even if you're new to use endoscope, you'll be able to get the hang of operation quickly. Once installed the app, plug it into USB port on your computer or micro USB port on your phone, then you're ready to go. Armed with a bendable semi-rigid cable that can bend and hold it's shape for inspecting a wide variety of confined place. This is of vital importance to pointing and positioning camera for different using angle. 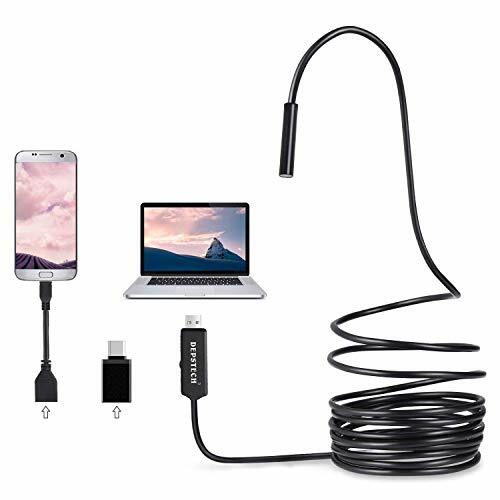 USB Endoscope for OTG Android 4.4+ Devices, MAC& Win PC With USB-C & Micro USB adapters, this borescope will be compatible with USB powered devices, computer and laptop (windows xp/7/8/10, Mac OS). HD 2MP Camera Sensor & Faster Chip Capture clear 1280x720 snapshot images for hi-vision lens; 30fps fluent video will be produced from Depstech newer chip. Unique Blue LED technology 6 adjustable blue LED light on camera tip, reducing over exposure, it greatly improves image brightness and clarity even in dark or low-light condition. 0.33in camera probe, IP67 Waterproof Easy to explore unreachable or hard-to-see areas such as underwater pipe, car engine, vent pipe etc, great function in scientific,industrial or household use. Depstech Semi-ridged Cable Armed with a bendable cable that can bend and hold it's shape to access a wide variety of confined place, such as curved holes or pipes. This newest type Depstech wifi endoscope has surpassed the traditional endoscope's using limitation for iPhone user. It can work perfectly with Android 2.3+ and IOS 6.0+ smartphone. Will be a best inspection tool for iPhone user. This camera needs to be connected with your phone via wifi in your phone network settings, instead of the app. Device Compatibility - this endoscope is compatible with most smart devices. Androids (2.3+) excluding Google pixel 2 temporarily and iPhones (iOS 6.0+). Bright blue LED lights Technology - Adjustable lights improves visibility in the low or no light areas and reduces over exposure. Connect multiple devices: 3-4 devices can simultaneously view the live inspection videos and photos. Faster FPS - This Endoscope has 30 FPS, that's 20 frames higher than other endoscopes on the market. Endoscope camera is a professional inspection camera tools for the checking and maintanace of machine. Installation, inspection and diagnostic jobs often require access to hard-to-reach or -see areas. It comes with accessories of hook, magnet,and side mirror for pick up work, and wider angle of viewing. The 4.92 feet semi-rigid cable could hold the shape and long enough for various of using. Support IOS 6.0+ devices to view live image,including iPad iPhone. Support 1-2 device to be connected simultaneously to view the live inspection photos or videos. 1. Download and install "HDWiFi" app on your device from Google Play or APP Store. 2. Turn on the WiFi transmitter by Button for 5 seconds until blue light up. 3. Open phone's WLAN or wifi setting, find wireless signal named NIDAGE*****, click it and input password "12345678" to connect. 4. Open the application for "HD WiFi", the image will be dispalyed automatically. 5. Work with Android smartphone,iPhone IOS devices. Advanced 5.5mm Camera The head of the digital endoscope camera is 5.5mm diameter which enables it to reach smaller pipes and areas where those old version 8.5mm borescopes can't fit. Freely bend 4.92FT Cable The semi-rigid cable, mirror, magnet and hook put you in complete control of the camera's line of sight. It's much easier than ever to access tight spaces and inspect confined areas. High Resolution Inspection Camera Featured with 2.0MP 1080P HD camera, the wireless endoscope camera offer you a wonderful experience of recording clear HD video in AVI format and snapshot image in MJPEG format with 3 adjustable resolutions 1920x1080, 1280x720, 640x480. Brighter and Clearer With 6 adjustable LED light, the smart phone inspection camera suits for various environment, such as low-light or dark area, damp or wet area etc. Brightness can be adjusted freely according to different occasions. 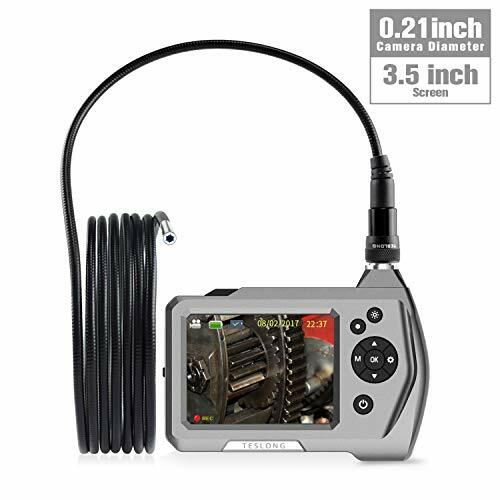 Versatile Snake Camera This wireless borescope camera works for automotive/diesel repair and maintenance, industrial testing, pipeline testing, outdoor testing and other industry fields. It minimizes the need for machine disassembly to save time and money. 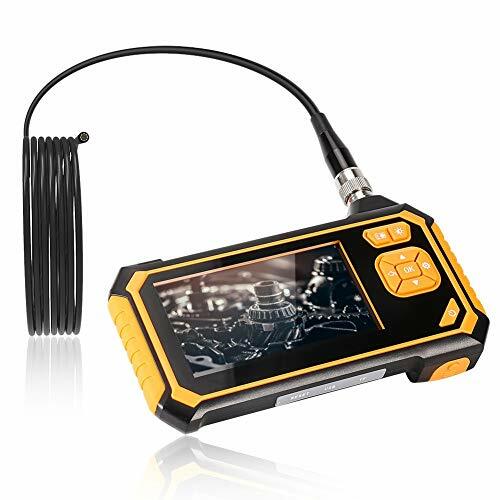 Features: Upgraded Version wifi endoscope has made some upgraded improvements based on our previous yellow wifi endoscopes, which can support real-time video viewing, video recording and picture capturing, etc. Its 5.5mm diameter camera is much smaller and useful in narrow and hard to see places, such as vehicle repairs, sewer inspection, vent pipe inspection,etc. 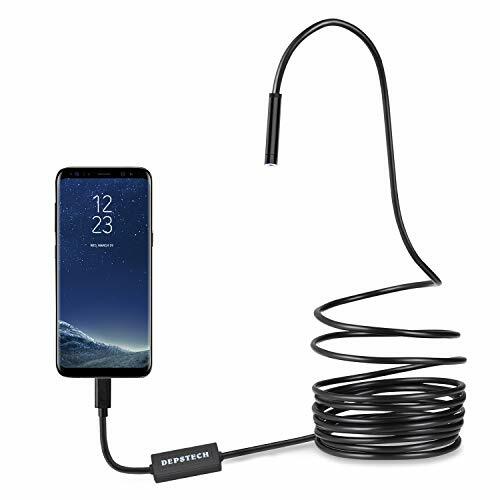 WIDELY COMPATIABLE & SUPER LONG This is the LATEST and LONGEST wireless endoscope design at the moment, unlike other traditional endoscopes on the market, this wifi endoscope camera can support both Android smartphone(Above Android 4.4) and iPhone IOS system(Above IOS 8.0). This wireless endoscope has made some UPGRADED improvements based on our previous black wireless endoscopes, the camera is MORE CLEAR and the battery works MUCH LONGER. High Capacity 1800mAh Battery With REAL 1800mAh built-in Li-Ion battery, its working time can reach 3-4 hours, which is MUCH LONGER than most of other wifi borescopes that last LESS THAN one hour. Zoomable Focus Feature You can zoom in or zoom out the picture or video to inspect some dark areas more clearly and accurately, you just need to press the + or - button to adjust it, which has 3 enlarged and narrow modes. 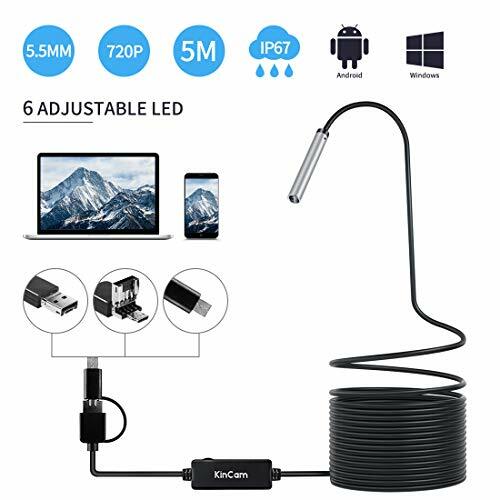 KinCam USB endoscope adopts high quality material with 5.5mm diameter camera head, 6 adjustable LEDs, 2.0MP CMOS HD camera, capture clear images and quality videos, put the unseen world in your palm. such as vehicle repairs, sewer inspection/maintenance,vent pipe inspection etc. Plug and Play: Once installed the App, plug it into USB port on your computer or USB-C/micro USB port on your phone, then you're ready to go. Broad Compatiblity: 3-in-1 Integrated Ports include Micro USB port, USB Type C port, standard USB port. Widely usefull: Easy to explore unreachable or hard-to-see areas such as underwater pipe, car engine, vent pipe etc, great function at home and industrial. Diameter 5.5mm: This USB endoscope reaches small pipes and areas where those old fashioned 8.5mm camera can't reach. Before purchasing, please make sure your computer sistem (Windows XP/7/8/10,Macbook OS) or Android Phone(Android 4.4+ system), and your phone supports OTG function. Powerful Performance -- Bendable semi-rigid 16.5FT cable, 5.5 mm diameter camera with IP67 waterproof level. 6 adjustable LED light supply a clear and bright view, it can suitable for various types of environment, low-light or dark area, damp or wet area etc. High Resolution -- Up to 2 Megapixels 1200P HD camera with 3-6cm best focal distance provide a HD adjustable Resolution ( 600x800,1024x768,1280X720 ),Easy to Record high-definition video and Take photo. Multipurpose Use -- KinCam endoscope camera is 5.5mm can reach to smaller pipes and areas that 8.5mm borescopes can't fit in, Waterproof snake camera Armed with a bendable semi-rigid cable widely used for drain,vent pipe,air condition,wind ,turbines,aircraft,machine equipment, engine, automotive, boat,PCB detection,gun tube,narrow prob eand 4 additional accessories mirror, hook, screw cap, magnet can help you solve specific problems. 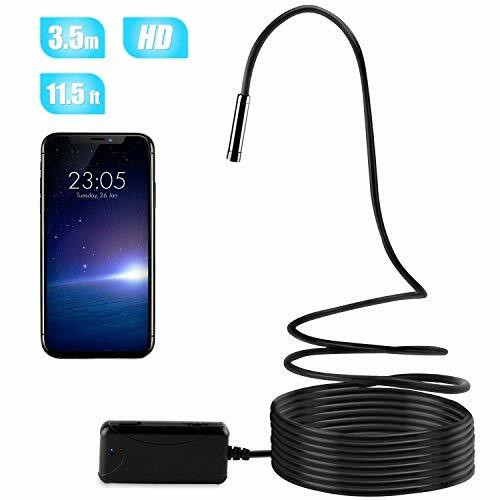 Easy To Use -- 3 in 1 USB Borescope can easy connect with Android smart phone /Windows/Mac/PC/Table. No need for extra USB adapter, just download APP and plugging in to use ! Teslong Upgraded Semi Rigid Gooseneck Industrial Endoscope The NTS200 endoscope now has a stiffer semi-rigid probe with 0. 32 inch diameter which is the most rigid endoscope probe on the market, it helps you to reach the place you want to see much easier. Fixed focal length The camera is a fixed focal length cam, the depth of focus is between 3 to 6cm(1. 2~2. 4inch). The focal length can neither be modified automatically nor regulated manually. 6 LED lamps with the luminance adjustable We have a distinctive technique for the lamp LED of detector for the endoscope, the maximum luminance of LED is much brighter than any other brand of those controlling camera, what s more, it has a longer life span. Waterproof IP67 All the detectors are waterproof IP67. Before out of the factory, the detectors have gone through waterproof tests and are suitable for drain-pipe repair. Attention: Non-waterproof for display screen, handle and joints of probe! Photograph and video Resolution ratio (photograph): 640*480,720*480,1600*1200,2048*1536(Pixels) Resolution ratio (video): 320*240,720*480,1280*720(Pixels) Other characteristics: Semi-rigid probe, possibly bent and kept the shape. Detachable screen design, separation of screen and machine frame, adaptation to different working environment. Equipped with outlet and cable of Video-out, real-time demonstration possible on other screen. Luminance auxiliary with the LED electric torch of high-light 1W. Handle with the direction adjustable. Consolidation with stainless steel for vulnerable parts. Languages available: English, French, German, Spanish, Portuguese, Japanese, Chinese. Please contact us via Amazon message if there is any question about the item. The classic industrial endoscope of Teslong brand, which has been in great demand for 5 years, it is widely used in the fields such as car maintaining, mechanical inspection, pipe repair and house maintenance, etc. Extend the length of probe cable to 5 meters, making your view field further. Upgrade cable stiffness, the 0.32 diameter metal gooseneck stiffens stiffer than other conventional endoscopes, it flexes and retains its shape better. Equipped with a 3.5-inch QVGA color LCD display, you can use it immediately when it is powered on. It is simple and convenient, do not require phone and computer to download any driver softwares. For Teslong, every product has a 12 month warranty and unconditionally return or replacement. Feel free to contact us if there's any question about the item. Why should you go for FrankincenseOman ? The Endoscope which is offered by FrankincenseOman has gone through a lot of quality check to ensure our customers satisfaction and unforgettable experience. In FrankincenseOman we adopt new technologies faster than others, thus our customers always find themselves ahead of other users. How is our Endoscope the best in the market? The bulk of endoscope cameras available in the market is compatible with either IOS or android only, which limits the usage of the camera. Our Endoscope camera is equipped with hardware that allows it works with both systems IOS and android; as well as windows system. FrankincenseOman offeres unique features in its borescope camera that give the user a distinctive experience. One of these feature is the provision of 8 LED lights compared to 6 LED in other brands borescope cameras. Give it a spin now. FrankincenseOman trusts its customers, so we offer you 60-day no questions asked warranty. If you don't like it just return it back and we will refund you all of your money immediately. With FrankincenseOman Endoscope, get the most bang for your buck! 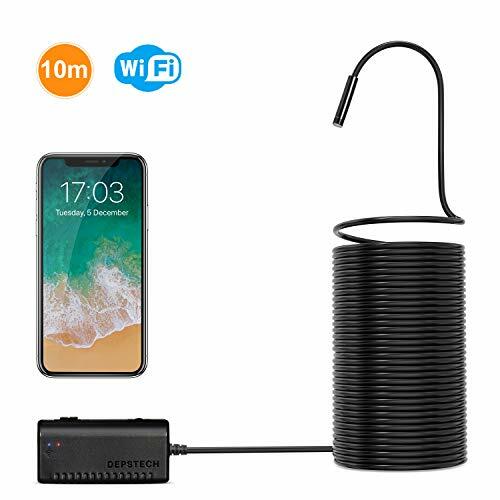 The wireless borescope is equipped with hotspot connection, and it can not only be used on Android smart phones, but also on iPhone IOS, MacBook and Windows devices. What you should do is just installing the APP "y_camera" downloaded from Google Play or Apple store, which can be operated easily. The resolution ratio of 2.0 Megapixels endoscope can maximally reach 1280*720 HD, 8 adjustable LED lights can make the image delicate, make the color vivid and restore the details under the dark conditions. The 5m semi-rigid cable is great for allowing more control of the direction of the inspection camera, especially as this tool in intended to get into small spaces that would otherwise be near impossible to see. The 8mm diameter camera probe is IP67 water resistant, can be shoved into water pipes, car engines or other narrow areas. The endoscope is provided with 2 hours lasting chargeable battery. The endoscope camera probe has a tiny mirror, a magnetic rod, and a hook to help you get back the dropped little things like coins, keys, and earrings. What in the BOX: 1x endoscope camera, 3x accessory attachments, 1x user manual. Buy with confidence, we offer 60 Days no questions asked guarantee. Teslong NTS150RS Endoscope is a portable, handheld, multifunctional inspection system with 3.5''LCD screen, Function of the Zoom, 360 Degree Rotation and DVR Digital Video Recording. With 5.5mm-9.84ft Classic Probe -The most popular endoscope probe of TESLONG, only 5.5mm, easy to extend the field of view to car spark plugs, wall drilling and other narrower spaces. Easy to Use -Built-in 3.5-inch LCD color screen and 2600mAh rechargeable lithium battery, the endoscope can be worked right out of the box. Do not require phone to download any driver software, no more worrying about smudging your smartphone. Clear View Image -The unique anti-glare technology helps to reduce the camera being over exposed, which keeps the image sharpness and fidelity. Micro Inspection Camera with 6 adjustable LED lights help get a better view in dark environment. Semi-rigid Snake Cable -We insist on using high-quality metal gooseneck which flexes and retains its shape better than any other cheap hard wire, you can shape it for your special use. What You Get - TESLONG NTS150RS-5.5-3m Industrial Endoscope, 8G MicroSD Card(Installed), Accessories(Mirror, Hook, Magnet), Micro-USB Cable, User Manual, Hard Plastic Case, 18-Month Warranty and friendly customer service.